Paul Halpern is the author of the new book The Quantum Labyrinth: How Richard Feynman and John Wheeler Revolutionized Time and Reality. 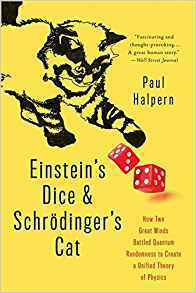 His many other books include Einstein's Dice and Schrodinger's Cat and Edge of the Universe. He is a physics professor at the University of the Sciences in Philadelphia, and he lives in the Philadelphia area. 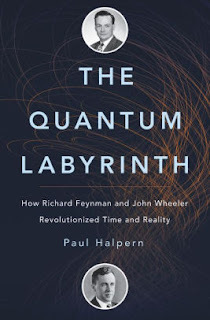 Q: How did you come up with the idea for this book about the physicists Richard Feynman and John Wheeler? A: Back in 2014 I was invited to participate in the Lantern Theater Company's production of the play QED, which is a one-man show about Richard Feynman's final years. I offered some advice on stage directions about a Feynman diagram, and invited to lead a panel discussion about Feynman after one of the performances. It was a great play; very enlightening. During the panel discussion, the director asked if anyone in the audience had Feynman stories. A gentleman raised his hand and said that Feynman came to his house when he was a kid and demonstrated an experiment in the kitchen involving tossing soup cans. I asked the man who he was and he said "Jamie Wheeler." He was John Wheeler's son! I knew that Wheeler was Feynman's advisor at Princeton, and that Wheeler's archives were in Philadelphia where I lived. I had also seen, around the same time, an inspiring talk about Wheeler by science writer Amanda Gefter, who, like I, had attended Wheeler's 90th birthday celebration back in 2002. I had great memories about interviewing Wheeler in his later years, and finding him to be a warm, fascinating person. All the stars seemed to align (as they say) for me to write a book about Feynman's interactions with Wheeler. Q: How would you describe the relationship between Wheeler and Feynman? A: The relationship between the two began when Feynman was assigned, by chance, to be Wheeler's teaching assistant. During their first meeting together, Wheeler put his watch on the table to time their meeting. He wasn't impatient, but wanted to be more efficient. The next session, Feynman bought a cheap watch. Right when Wheeler took out his watch, Feynman removed his and set it next to Wheeler's. The two had a hearty laugh and a great friendship was born. It was a friendship of contrasts. Wheeler was very quiet, had a dry sense of humor, and always wore a suit and tie. Feynman was loud, raucous, told wild stories, and loved to dress down. On the other hand, Wheeler was full of wild ideas, such as his notion that there is only one particle in the universe that zigzags back and forth in time. Feynman was much more cautious in his physics. Yet he managed to distill what was important about Wheeler's ideas and brilliantly transform them into revolutionary new physics. They remained friends for life until Feynman sadly died of cancer in 1988. Q: What would you say is each man's legacy today? A: As a young researcher, Wheeler developed an important scattering model and was second author (with Niels Bohr) of an important paper on the mechanism of nuclear fission. Later in life, he made his mark by brilliantly coining colorful terms describing various physical models at the far reaches of thought, from wormholes and quantum foam, to the participatory universe. While, strictly speaking, he didn't coin the term black hole, he was the first physicist to use it widely and was a leading explorer of that concept. 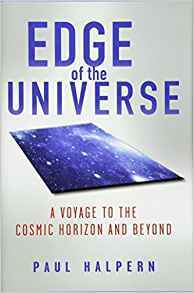 His talented students became well known in their own right, Feynman, of course, but also Kip Thorne who co-developed the LIGO project that first detected gravitational waves, and Hugh Everett, who hypothesized the "Many Worlds" (parallel universes) interpretation of quantum mechanics. Feynman's Nobel Prize was for his pivotal contribution to Quantum Electrodynamics: the complete quantum description of electricity and magnetism. He also proposed nanotechnology and quantum computers, developed successful models of liquid helium and a theory of the weak interaction, and was a pioneer in physics education reform. Feynman diagrams are used every day in physics. His incredibly animated and clear explanations of physics are still popular videos. Plus, as a sideline, he performed music (drumming), was an actor in many Caltech productions, and a talented sketch artist. A: I researched the book by reading much of the correspondence between Feynman and Wheeler, and conducting numerous interviews of their family members, friends, and former students. Some of the most surprising things I learned were personal accounts of interactions with Feynman by his former director (of Caltech plays), one of his artistic models, and a colleague who remember him almost getting into a fistfight over an equation. Plus there was an incident with a boa constrictor personally told to me by his good friend Freeman Dyson. Feynman was certainly a colorful character. Wheeler was more interesting in terms of his far-reaching ideas, such as the concept that human conscious observation of the past helped shaped it. A: I'm working on a scholarly article about Einstein and the press, preparing many talks, and writing for Aeon and Forbes online magazines. Plus taking care of Kepler, our standard poodle, who is adept at sticking his face in front of my computer screen if he thinks it is time for a walk. Keeps me balanced and fit! A: I'll be speaking at bookstores and other venues around the country. Check my website: quantumlabyrinth.com. --Interview with Deborah Kalb. 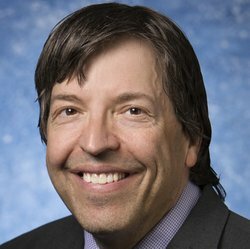 Here's a previous Q&A with Paul Halpern.